Ya Jagoff!!! | Oh My Gawd, Oh My Gawd.. No! Not Ovie....No! Home Hockey Jagoffs Oh My Gawd, Oh My Gawd.. No! 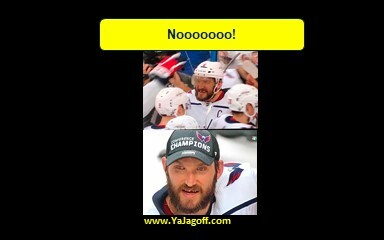 Not Ovie….No! Hollleeeee smokes! Please say it is NOT so! Alexander Ovechkin is 4 wins from having his name on the Stanley Cup! Like, what in the world are we going to do? The weird thing is, Ovie is playing with some kind of, that-son-of-a-B-just-ordered-a-Primanti-sandwhich-without-fries-and-coleslaw, crazed look in his eye. We saw it as they beat the Pens. Then we depended on former Pen and Stanley Cup champ, Chris Kunitz, and his Tampa Bay Lightning to make the stop. But nope! The crazed Ovie continued to look even more crazy.. as if he was a Pittsburgher that said, “Hey, you NEVER order a Primanti Sandwich without the fries and slaw,” and THAT person turned and said, “That stuff just shouldn’t be on a sandwich,” to him. And now he’s on a mission. One last gauntlet in our favor, Marc Andre Fleury who is quite used to being am Ovechkin-dream-balloon popper! So, don’t fret over the steak and cheese (or, in my case, salami and cheese) just yet! As you know, we always say here that the phrase, “Ya Jagoff,” has a term of endearment angle to it! So, as I stare nervously at my salami sandwich, WITH FRIES AND SLAW ON IT…. Let’s go Golden Knights…YaJagoffs! Please use the buttons on the screen to SHARE this post with your posse, peeps, or pets! You may have heard about the new General Data Protection Regulation (“GDPR”), that comes into effect May 25, 2018. To help comply with GDPR consent requirements, we need to confirm that you would like to receive content from us. We hope that our content is useful to you. If you’d like to continue hearing from us, please update your subscription settings. Previous articleIs This Truck Driver from Ohio? How can we tell? A Jagoffa-tier (Jagoff Artist) in Delaware!